It seems my complaints did the trick. We found chukar everywhere and anywhere last weekend. I have never seen so much chukar poo, and rarely if ever have I encountered so many chukar in two straight days. We worked for them, sure (about 5,000 vertical feet in two days), but they were high, low, and middle. Angus even pointed two in a tree near the water. I’ve never seen chukar in a tree. I shot like poo, but ended up with a good amount of birds. The best thing, though, was seeing so many birds; after hearing them all spring and summer and having a tough time finding them this fall, it’s nice to know they’re out there in big numbers. One covey consisted of at least 75 birds. Great stuff. Glad to see someone having so much fun. Way to get Bob into the birds Angus. Leslie, what a great job of making Bob look great. Bob, thanks for the great entertainment. My computer has found a virus or something. I lost all my hunting notes and pictures. I’m taking it down to town and hope someone can fix the problem, but if not I’m hoping you have some more good stuff when I get it back. Thanks, Larry. Bummer about your computer. I hope they can salvage all your stuff – what a treasure trove it must be. Either way, I’m hoping to have more fun stuff soon, and we should have The Kid back with us next weekend. 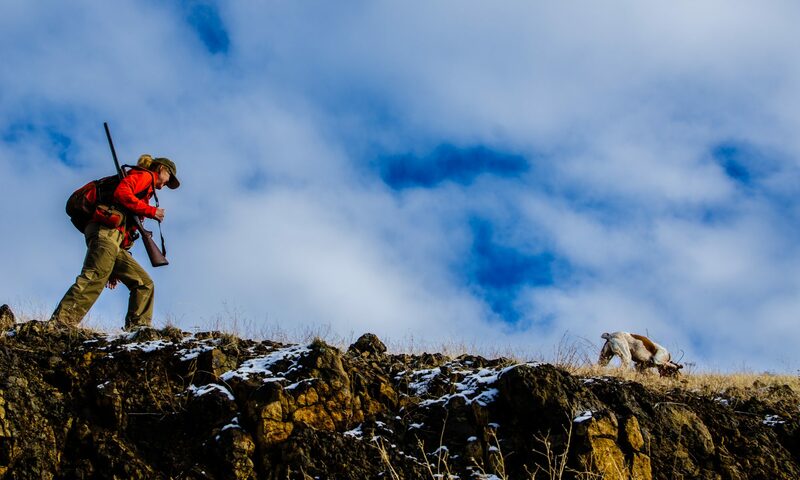 He still needs to bag his first chukar. Awesome video. Looked like you shot from your knees on that one bird .I also like the part where it looked like you and the dog were working the birds side by side. Oh ,if we could only point! Thanks to the lady with the camera. Best action shots yet .Too bad the boys didn’t go. Thanks, Alan. Yeah, I shot from my knees and killed that bird that flew behind me, but I couldn’t hit any of the dozen or so that exploded right in front of me. Typical. Too much thinking time? Should be getting the youngsters out this weekend. I hope the birds don’t get flash frozen with this ice-wave about to hit us. came across your blog….I don’t normally post on any of these things….but just wanted to share with you how to dispatch the bird in a humane way…we owe them that !!! hold the bird upside down with both hands and gently bob up and down (slowly)..the bird will relax somewhat and the head will start to hang a little…that is the point at which you want to “swing” the bird in a short swift stroke so that the BACK of the head contacts a rock,fencepost, or gun stock….birds have very fragile skulls and this method rarely takes more than the one swift pop to kill the bird.. shot my first chukar 45 years ago, so have a fair idea of what I am talking about.. Thanks for the nice words, Steve. I don’t know a dog owner (who likes his dog) who isn’t biased, but I’m sold on the Brittany breed. Stickers are a pain with any longer-haired dog, but we keep Angus shorn fairly short so it’s not too bad. It’s also a kind of bonding time for us, and in a way he seems to enjoy it (and he’s incredibly patient). And yes, I still highly recommend Sunburst and our next pup will be from Gabe. Two of my friends here have Sunburst pups (Angus’s nephews), and they’re stellar pets/hunters. Good luck with the rehab on the bionic knee, and I hope you see a rebound in bird numbers out your way soon! Great video as usual. Your wife is awesome with the camera. It wasn’t a great weekend for me. I just need to quit chasing the ilusion of pheasants. What a wonderful dog! Enjoyed your video.